Hawai'i-island artist Hana Yoshihata is inspired by her experiences on traditional voyaging canoes such as the Hokule‘a. Working on sheets of paper placed flat on the floor or table, Yoshihata applies sea and fresh water, and adds ink and paint, allowing them to flow together and dry freely. 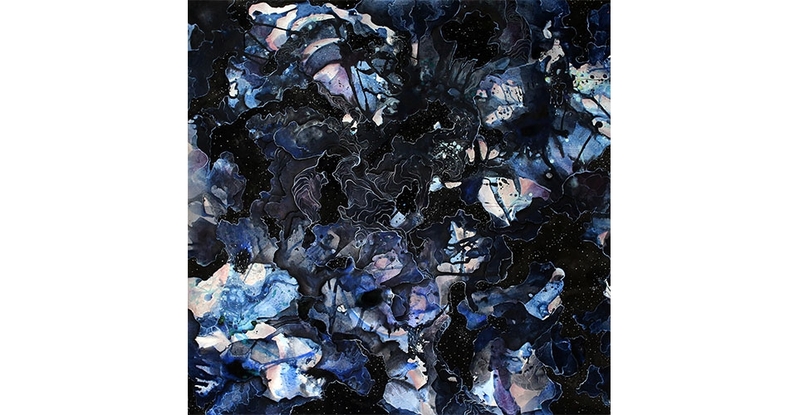 She often combines this technique with detailed brushwork of linear patterns and forms, resulting in sensual, layered surfaces that evoke coastal and submerged topography, or the vastness of the night sky. Maui-based wood artist Derek Bencomo uses the wood’s natural shape and grain lines to create fluid pieces that curve and stretch out in three dimensions. 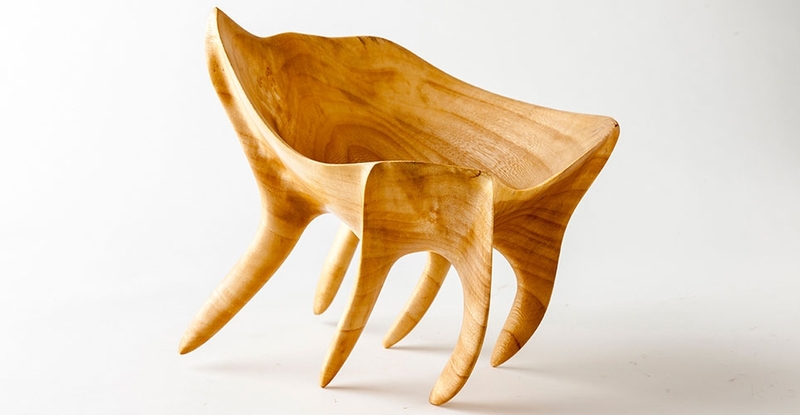 His works appear to be crawling or dancing on spider-or-anemone-like legs or call to mind natural shapes such as shells, leaves or flower buds. Dana Brewer draws inspiration from the natural world and from the power of heat and gravity used in the creation of her glass forms. 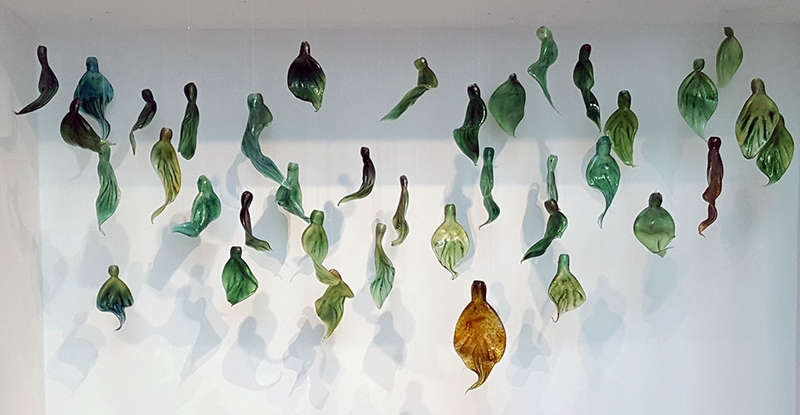 Her installation designed for the First Hawaiian Center gallery features multiple blown glass leaves and is reminiscent of the shape and movement of a waterfall. 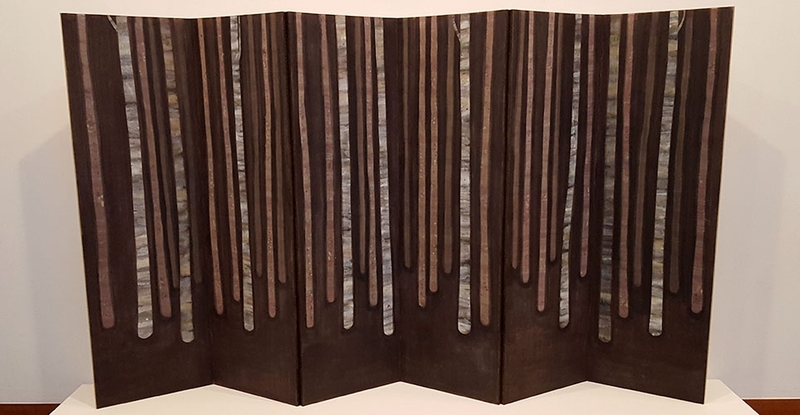 Artist and paper conservator Hiroko Sakurai exhibits images of trees on multi-panel screens, scrolls, and mixed-media paintings on wood. Her works express a stillness and tranquility in their simplified forms and employ meticulous handwork, often borrowed from traditional art and craft techniques, which she practices repeatedly and patiently, as though the process were a kind of meditation.